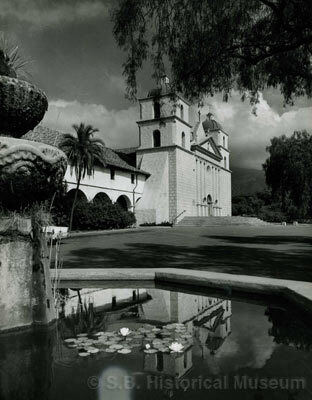 Karl Obert originally came to California in the late 1920s to photograph the state's lush landscape, as exemplified by this picture of the Santa Barbara Mission (taken in the 1950s). Question submitted by Joy Knapp. One of the best-known photographers on the South Coast from the 1930s into the 1960s was the German native Karl Obert. After a successful stint in commercial photography in Europe in the 1920s, Obert immigrated to the United States, made his way to Santa Barbara, and carved out a notable career here. Obert was born to Swiss parents in Breisach on the banks of the Rhine River in 1897. He spent most of his childhood near Freiburg, slightly north of his birthplace. In 1911, his parents sent him to Basel, Switzerland, to complete his secondary schooling. The outbreak of the First World War in 1914 necessitated his return to Germany and he soon found himself in the army. Military service was definitely a mixed blessing for the young man. It was while in the army that Obert began to hone his photographic skills. One might think this would be relatively safe duty, but Obert was wounded three times during his four-plus years in the service. By the end of the war, Obert knew he wanted to make photography his life’s work. He continued his education at the University of Munich and received his Master’s degree there in 1923, the year that Adolf Hitler attempted his abortive overthrow of the national government in that city. Obert went on to a fine career as a commercial photographer, working for a variety of newspapers, magazines, and book publishers. He specialized in landscape photography during this period. His scenes of the Black Forest, the Rhine River, and Lake Constance in Switzerland were among those that appeared in several well-received books. Obert came to the United States in 1926 and settled for a few months in Illinois. While there, he heard of the scenic wonders of California and of an especially picturesque city called Santa Barbara. For a landscape photographer, the pull was irresistible. He made his way west and soon was working out of his home in the 600 block of Chapala Street. He traveled extensively up and down the state for three years producing photographs for a book that would document the natural and man-made beauties of California. It was a fine idea, but Obert’s timing was unfortunate. The stock market crash of 1929, followed by the economic doldrums of the Depression and then World War II, postponed the project for years. Not until 1957 did his book, This Is California, published both in the U.S. and Germany, appear. The book went through three printings and eventually became a collector’s item. In this country, the book was distributed by Lane Publishing Company, publishers of Sunset magazine. Among the South Coast images in the book are Channel Drive, various Montecito estates, Fiesta, and, of course, the Santa Barbara County Courthouse and the Old Mission. Also included are shots of the annual trek of the Rancheros Visitadores. For more than 40 years, Obert was the official photographer of this fraternal men’s equestrian group, and he had the opportunity to photograph such notables as Walt Disney, Clark Gable, Leo Carrillo, and artist Edward Borein, among others. A number of the images in This Is California are cityscapes. Obert enjoyed a fine reputation as an architectural photographer. His architectural images appeared in the book Californian Architecture in Santa Barbara, a visual study of the Spanish Colonial Revival style, published in 1927 and reprinted in 1990. An Obert photograph of the Santa Barbara Mission won a Bronze Plaque at the 1933 World’s Fair in Chicago and for decades was on display in that city’s Museum of Science and Industry. Obert was a member of both the Photographic Society of America and the Royal Photographic Society of Great Britain. By the late 1960s, ill-health had slowed his output, and he retired in 1973. Three years later, Karl Obert died, leaving behind a body of work of high quality and stunning variety.